At Happy Makings, we welcome beginners and novices, kids and adults, into a shared studio space to play, explore, express, and take risks. We believe that the process of making art in the moment – free, intuitive, and deeply connected to who we are and what we feel – makes us happier and more fulfilled. Our space focuses on beginners and those who feel they are “not an artist”. We feel everyone benefits from creative exploration and expression. The joy is in the journey. 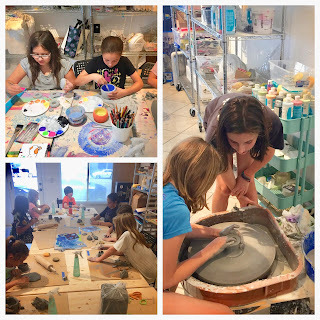 We offer weekly classes, day camps and workshops in ceramics, painting, and various mediums. Ceramic work includes hand building and sculptural techniques using extruders, slab rollers, and the pottery wheel to build our pieces. Students add mixed media to the world of ceramics, and also work with various glaze and finishing options. Painting and mixed media classes develop tools and techniques including composition, color and pattern, and ways of seeing in order to facilitate the process of getting students’ artistic vision onto paper, canvas, and more. New Classes starting in October!